The Walkman music player is part of the equipment of all recent Xperia smartphones. It now features wider audio support - in addition to popular formats such as MP3, AAC, WAV, the Walkman player also handles ALAC and FLAC. Digging into the settings your can select custom presets for a wide range of Sony headsets, including the bundled NC31E/EM noise cancelling headset, which takes advantage of the built-in noise cancelling features of the Xperia Z3. The Sony Xperia Z3 was able to play most of the video files we threw at it but had some issues with AC3 audio and videos that combined AAC audio with the AVC video codec. MOV files played without problem, a rarity on an Android device. In any event, you can always download a more capable (codec-wise) third-party app from the Google Play store. The Sony Xperia Z3 did well in the first part of our audio quality test, which is where we plug it into an active external amplifier. 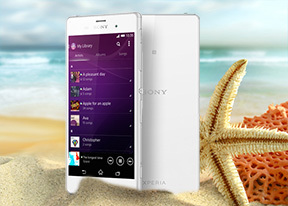 The smartphone produced excellent scores all over the field as befits its flagship status. 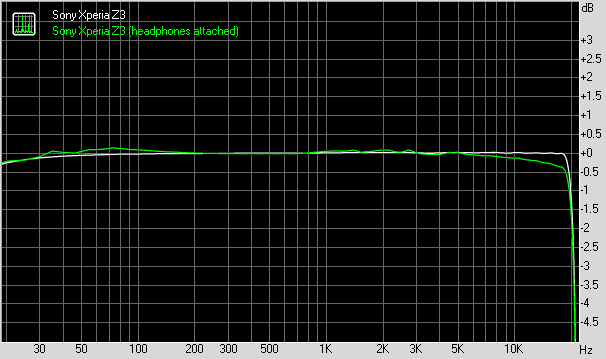 Volume levels however were rather disappointing so we can' give it full marks here. Plugging in a pair of headphones leads to a moderate spike in stereo crosstalk, but the rest of the readings remain pretty good. Loudness deficiency hasn't been addressed, though, preventing the Xperia Z3 from matching its rivals despite a solid showing.